At Treetops we are proud of our Teachers and Non Teaching Staff. We believe that the quality of our staff is one of the most important factors in Treetops’ students’ excellent education. As part of our ongoing commitment to an outstanding education at Treetops, all our staff are provided professional development opportunities throughout the year, along with a system in place to ensure regular communication throughout the different school areas and a small, but strong, support system in the Administration. From the first person you’ll meet when you walk through the Administration doors, to the last teacher you see packing up in the evening, Treetops staff members are working at Treetops because they have a strong belief in the Montessori and International Baccalaureate education philosophies, and love witnessing an excellent education of the whole child. Stuart has held managerial positions across both secondary and primary school. He is an experienced educator with a background of twenty-one years in the independent school sector, with equal experience across primary and secondary schooling. Stuart originally trained as a plumber and returned to fulltime study in his early 20’s. He is married and has three children, the eldest of whom is himself a teacher. Stuart enjoys riding his mountain bike and loves the Hills lifestyle. Jayne, who has been teaching at Treetops since 2005, is currently in the position of Deputy Principal and Director of Enrichment Programs. Jayne has two children, both of whom attended Treetops. She and her family, together with a dog, cats and chickens, live on an acre in Darlington close to the school. Jayne’s interests have included endurance cycling, mountaineering and rock climbing, ski-ing and organic gardening. Jayne was educated in England, and came first to Australia to compete in a 5,200km mountain bike race across the centre of Australia with her husband, on a mountain bike tandem! This turned out to be a life-changing experience in many different ways and she and her husband emigrated to Western Australia shortly afterwards. Formerly a Primary Class teacher, Jayne’s interest for working with students with specific learning difficulties was ignited in Scotland when she worked with a dyslexic and very talented student in her class who, one year off the end of Primary, was still struggling to read. He went on to a career in professional acting and she went on to complete training and specialist qualifications and set up Learning Support Departments which became integral to the learning experiences offered to students in three K-12 schools. Jayne began her teaching career at Treetops when asked to first assist with a student with special needs who she continued to support throughout this student’s 13 years at the school. The recent donation of the furnishings for a resources room for enrichment classes by this student’s family mark both their satisfaction with the assistance received and the growth of enrichment throughout the school. While enrichment education remains her passion, Jayne has utilised her lengthy and broad experience in educational settings to assist in the administration and management of Treetops. She enjoys problem solving, systemising, and supporting her colleagues and the broader Treetops community. Giselle has been at Treetops for over 11 years and has worked in almost every part of the school! However, she is best known for her beautiful nature and warm way of welcoming new families to the school through her role as Playgroup Leader. With experience in every Montessori cycle, Giselle brings extensive understanding from her Education Support role and previous years in child care and public school education. With a passion to ensuring a child’s learning journey begins from a happy and confident experience, Giselle most loves watching a child grow more confident from accomplishing a task independently. She appreciates the Montessori method of learning through perceived play and especially enjoys working in our Playgroup because of te environment that allows children to reach their own potential. Giselle has two children and, along with her husband, has cared for over thirty children as a foster carer since the year 2000. Anene began her teaching career after studying English Language at Cambridge University. She worked for the British Council, teaching English for two years, in Qatar and The Sultanate of Oman before training as a Montessori Teacher in Vancouver. Anene taught pre-school in Oman and Scotland before joining Treetops in 2015 as a relief teacher and librarian, as well as running a three-year-old program. Anene is passionate about helping children develop a love of learning by promoting their intrinsic motivation, in so doing, they become enthusiastic about their own learning. Anene lives locally in Darlington with her husband and three children, two of whom graduated (IBDP) from Treetops. Anene loves to travel, garden and quilt! Natalie is the Wattle teacher (educator/directress). Natalie has previously worked at Riverlands Montessori School and Casa Mia Montessori School, but is delighted to now be a part of Treetops Montessori School. Natalie has been a part of Montessori education since she was a child. Her mother set up several Montessori Pre-Schools in Papua New Guinea and the UK which Natalie enjoyed being part of, creating many resources for and ultimately working In them. When Natalie graduated from Edith Cowan University here in Perth she began work at Riverlands Montessori School as the Lower Primary Directress (year 1 – 3). As well as being the classroom directress Natalie was responsible for the resident emu’s, pet rats and the rescued ducks and chickens that found their way to her classroom which was named Animal Kingdom. Natalie left full time work at Riverlands Montessori to work as a DOTT teacher at Casa Mia Montessori in the 3 – 9 year old classroom before she stopped work completely when her children were born. Before returning to the classroom Natalie chose to complete her Graduate Certificate of Early Childhood Education and has now almost completed her Masters of Early Childhood Education. Natalie believes each child is unique and should be treasured for who they are. She loves welcoming all the children into her classroom each day and explains to them that the Wattle class is like a family where we all care for each other. She enjoys creating interesting learning programs based around the children’s interests, Montessori equipment and investigative play activities. Rene McNeil qualified with B.Ed from North West University in South Africa. She has been teaching for more than 10 years. She taught for 8 years in South Africa where she conducted the choir and taught Years 1-3. She gave private piano lessons and attended many professional development seminars. In 2013 she started studying Psychology and by 2015 had added it as a major to her degree. She also taught in an international school in South Korea for 2 years. This school used the IPC curriculum and lessons were child-centered. Rene immigrated to Australia in March 2016 and after teaching relief and volunteering in some Australian schools joined Treetops in July 2017. She loves teaching at Treetops and has been implementing the Montessori equipment and philosophy. She is enjoying getting to know the students and parents and working closely together with the other staff to bring about the best education for the child. Emma began her “working” career on the farm – from 1993 through to 2014 she fixed tractors, constructed electric fences, and continually moved stray cows off crops, roads, neighbours properties , and once even from a chook pen. However, she always had the burning desire to utlise her qualifications and teach. With six sons to continually instruct, moving into teaching was a smooth transition. Emma graduated from UWA in 1993 with a Science Degree, with a second Major in “Human Movement”, (now called Physical Education.) University was a different life from her previous “protected” world as a WAIS gymnast, travelling around and competing all over Australia. However, it’s farming that Emma firmly believes shaped her teaching philosophy. The concepts of never giving up, no matter what is thrown at you, fixing situations as best as you can, as sometimes you are on your own with no help and no one to give you the answers. Emma thrives on that ability to instill knowledge in children, and best of all loves to witness an eager face when that knowledge inspires them to seek more information. To Emma, teaching at Treetops is like being at home. Not only for our amazing physical environment, but in the enthusiasm of parents, the love of teachers for the children, the excellent education and the close connection that a multi-age system produces. Emma believes the Montessori environment provides everything children need to be able to develop an inner love for learning. Mary is a pianist and coordinates the classroom music program, private instrumental lessons, the school choir and any other ensembles as needed. Mary has been at Treetops for a number of years as she has three of her own children currently enrolled at the school. Mary has worked at a number of scholarship music schools across the city, including Churchlands Senior High and Perth Modern School. She has been trained in and uses Kodaly Methodology in the classroom and believes that every student has the ability to increase their knowledge and skills through using their voice as their primary instrument. Mary has been a conductor with The Australian Youth Choir for 10 years and has traveled throughout Australia, the UK and Europe with the choir as an accompanist and conductor. She has a passion for working with Children of all ages and believes that singing as part of a group is a very important when creating belonging within communities such as class groups and schools. This is one of the reasons that Treetops also has a staff/parent choir that occasionally performs at school events. Mary encourages all students to have a role within the music program, whether it be through learning class songs, whole school songs, school choir or learning an instrument. There is approximately one-third of the school’s population currently learning an instrument at school. Mary chose to become a teacher because of the wonderful influence of a handful of teachers in her own years at school and has chosen to work at Treetops because of the holistic approach to learning, the emphasis and importance placed on music within the school and because Treetops is a unique and diverse school with a strong sense of community and care for all students. Sharon‘s teaching philosophy is best encapsulated by Albert Einstein, that is “I do not teach anyone. I only provide the environment in which they can learn”. The environment Sharon creates in her Japanese classroom is one of authenticity. Realistic scenarios and culture-rich resources provide the basis for genuine language learning that can be transferred to the real world. Sharon loves witnessing the “lightbulb moments” that students have and feels privileged to be a part of their learning journey. She joined Treetops in July 2013 to initiate the Japanese language program and is proud that it now extends from Children’s House through to the IB Diploma Programme. Sharon especially enjoys the flexibility in content delivery and the fact that she has the autonomy to adapt programs to reflect students’ interests and educational requirements. Sharon has had some impressive achievements in her teaching career. In January 2013 she was one of only two Western Australian recipients of the Endeavour Language Teaching Fellowship. This involved three weeks of intensive Japanese language tuition at Kansai University in Osaka. She was also selected to attend the Intensive Seminar for Japanese teachers at the Japan Foundation Sydney in January 2016 and was a contributor to the Western Australian Curriculum: Languages (2018). Sharon was pivotal in Treetops being the only Australian school to be offered a place in the Hakuho Foundation’s 8th Scheme for a Global Children’s Japanese Language Network. Along with Japanese teachers from fourteen countries, Sharon spent three weeks at the Japan Foundation in Tokyo in November 2016 and then took four students back in April 2017 to engage in part two of the scholarship. Her dedication was rewarded further when Treetops was selected to be the host school for eighteen Japanese exchange students in July 2017. Sharon is happily married with three children and is a Glen Forrest local. She loves walking in the bush with the her dog and singing while she cooks. Sharon holds the rank of brown singlet in Muay Thai kickboxing, as well as a tomodachi cross. Kim is from Pittsburgh, Pennsylvania, where she graduated with an IB Diploma and is very excited to be teaching at a Montessori and IB school. She believes every child is a natural learner and that her job is to foster this in each child and young adult she teaches. Kim is excited to join Treetops mostly for its focus on the individual and independent learning. Kim attended George Washington University, majoring in Chemistry and Biological Anthropology. After her studies, she returned to George Washington to work as a laboratory technician. Her love of travel and service began while at University when she was able to lead a group of students through Belize and Mexico. After teaching in the US for one year she moved to the International School in Costa Rica where her taste for globe-trotting (and also the beach!) really took hold. Now living in Fremantle, she loves beautiful Australia and is excited to continue her journey with Treetops. Peter was born in Canada, and lived in a number of different countries until happily settling in Australia in 2006. He now lives in Darlington with his partner and two children. Peter’s teaching experience includes lecturing at universities in the US, a secondary school in Mexico, TAFE programs in WA, artist residencies, community inclusion workshops and guest lectures at various art institutions. Peter brings valuable industry knowledge to the classroom from his work across community and cultural development, social services and film and media production. As a practicing artist and photographer, Peter has been involved in over fifty exhibitions throughout the world and numerous curatorial projects and publications. Peter has a Graduate Diploma of Education (Art and Media specialisation), a Master of Fine Arts, and a Bachelor of Fine Arts. Peter has taught in a variety of settings that includes working for many years with people from diverse cultural backgrounds, experiences and abilities. Early in his career, Peter was a Counsellor then Assistant Director at an educational summer camp for at-risk students. The many positive outcomes from this experiential learning program had a profound impact on his career as an educator. In the subsequent twenty years, he has continued to strongly support creative exploration through tactile, collaborative and inquiry-based learning due to their positive impact on learning and overall student wellbeing. Along with wanting to work in his local community, these educational values are why Peter has chosen to work at Treetops. Paul obtained his Teachers Registration in 2016 and has been teaching at Treetops full-time since 2016. He holds a Postgraduate Diploma in Secondary Teaching (ECU) as well as undergraduate and postgraduate qualifications in Applied Science (UWA & NTU). Paul has a professional background in Geological Engineering and his teaching passion is focused around mathematics for all ages from Year 7 through to University Entrance (IBDP). Paul is a proud parent, enjoys travelling, home renovating and most outdoor activities. Sandy emigrated from England with her husband and two sons in 2009 after a career as a Teacher’s and Special Needs Assistant in the UK. Educated in South Africa and with extensive travel experience around the globe, Sandy and her family chose Darlington to bring up their family. With a Cert IV in Education Support, Cache Level 2 CPP Introduction to Pre-school Practice and Diploma in Personnel Management, Sandy believes Treetops provides a safe environment for all to build confidence in their ability to achieve both academically and socially, to become independent learners. She appreciates the close-knit community of parents, staff and students and the Montessori approach to education promoting independence. Sandy believes it is important that we give children the best start to their educational journey, under the direction of the teacher, and that we help children with their educational and social development, both in and out of the classroom. She loves that no two days at Treetops are the same and that she has the opportunity to utlise her skills in cooking, art, puzzle solving, working with small groups and one on one and helping children reach their full potential. For Sandy, witnessing a child master a task is the ultimate reward. Sandy has fully embraced the Australian environment; she is often rescuing bobtails, geckos and spider bugs. She’s passionate about our oceans and is a qualified Padi diver. Liz is the mother of three children ranging from 8 years to 18 years of age and comes from a very big family. This places her well to be in her fifth year at Treetops! She has experienced various educational philosophies with her own children but feels the learning at Treetops is a wonderful, nurturing environment for a child to flourish. Liz has seen the 3 year Montessori work cycle help a child develop from a timid 3 year old, to a 6 year old child who is creative, spiritual, independent, emotional, physical and intellectual human being that has had a fantastic grounding to embrace their learning journey. Liz has a passion for working with children which began in her teens when she became a swimming instructor and enjoyed watching children achieve levels they hadn’t previously believed themselves capable of. This lead to running a Private Swim school for children who had fears or problems with learning how to swim and this naturally lead Liz into education. In Liz’s personal life she has a passion for lead lighting, art and making things look beautiful around her. She loves nothing better than heading out with her friends for a 6am bike ride to welcome in the day. Tamera Skewes is an experienced Education Assistant who is a mother of two girls. She believes all children have the right to an excellent education that focuses on respecting and encouraging each child’s individual differences while providing a nurturing environment to teach social interaction and emotional skills. Tam has been employed as an Education Assistant since 2008. She has extensive experience in assisting children with a variety of special needs and learning difficulties as well as those with psychological and emotional challenges. Before children, Tam worked for several years in the residential building industry and with a husband who is a builder, this equates to her being a jack of all trades. Tam and her family have a genuine love of the great outdoors and they are often out camping over the school holiday period. She has a passion for AFL and somehow manages to cope with the rivalry between the Dockers and the Eagles during the football season. Stephanie started her working life as a Physiotherapist, a role which she played all over Australia and the UK for over 2 decades. As much as she loves her profession, and continues to practice it part time, she came to realise that it didn’t mesh as well as she might have liked with the demands of parenting a child at the very beginning of his years of formal education, and sought a new profession which might co-exist more comfortably with school hours and long summer holidays. She enthusiastically accepted an education support role at Treetops and completed her Cert III in Education Support. She brings with her a love of children and a special interest in supporting those that need a little more help in their learning journey. Her biggest joy is the sight of understanding dawning on a child’s face as they tackle previously difficult material. Katie first started at Treetops when she began playgroup at the age of three. She then went on to complete Primary Years at Treetops. She now works there as an Educational Assistant. Katie is currently enrolled in her third year of a Bachelor of Education (Primary) at Curtin University to graduate as a primary school teacher. Ballet and dance has always been a large part of Katie’s life. She also enjoys travelling to new places and reading inspiring and thought-provoking books. Katie has a passion for working with children of all ages. This has developed over the past two years when she visited a variety of both local and remote WA schools. Katie recently travelled to and tutored in Kalgoorlie, Norseman and Pia Wadjarri, as well as participating in regular university practical placements. These experiences have allowed Katie to put into practise her theoretical knowledge, enhance her teaching skill set and evolve her teaching philosophy. Growing up in Darlington, Katie has always enjoyed the friendly, supportive and inspiring atmosphere that the Treetops community and environment facilitates. She strongly upholds the belief that education should be inclusive and engage all learners by building on children’s intrinsic motivation to learn and promoting their inherent desire for the possession of knowledge. This approach creates curious, open-minded lifelong learners and valued, considerate citizens. 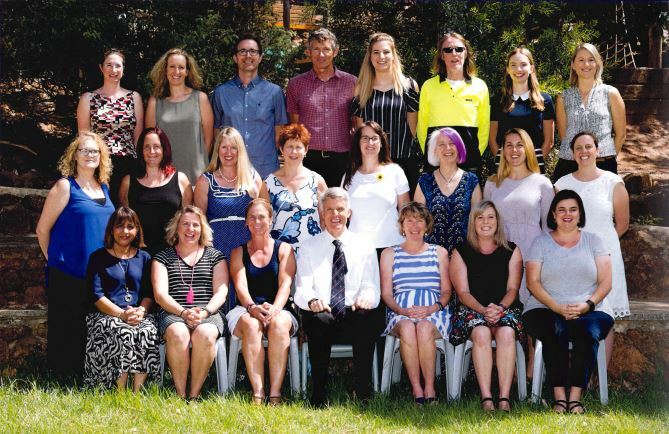 Treetops Administration staff combine a multitude of skills to run a vibrant and dedicated system for every day running of the school and support for teaching staff and parents and students. Treetops permanent Administration and Non Teaching Staff include a Business Manager, Bursar, Director of Communications, IT Specialist, Maintenance Officer and, most importantly, an amazing Receptionist.